There are so many rich and jewel-like tones that I associate with Christmas. Bright reds and greens remind me of the tiny elf jackets I imagined Santa’s little helpers would wear whilst they filled stockings on Christmas eve. Sparkling whites, silvers and deep greens take me to a magical winter forest with the footsteps of reindeer trodden gently into the snow. Warm oranges, reds and golds instantly transport me to a cosy kitchen in the lead up to Christmas, baking gingerbread, stirring the Christmas pudding and making a wish for the year ahead. A Christmas colour palette that I’m currently really into is one of rich and deep plum shades. It reminds me of the burning brandy on the Christmas pudding, delicious dark red dessert wine and spending time with family and friends around a table full of rich food. 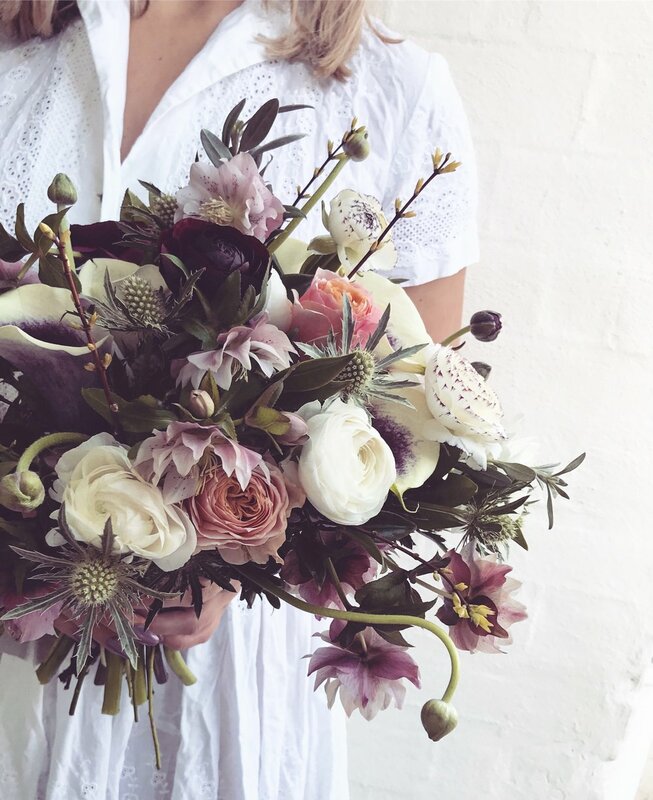 The deep plum colour palette is perfectly matched to flowers at this time of year as the colour is available in ranunculus, anemones, and there are also hints of the shade in hellebores and calla lilies too. Vibernum berries work perfectly alongside this rich deep plum shade as they are almost a petrol metallic black blue tone and add so much depth with their unusual colour. Other colours and tones that work alongside this lavish plum colour are pale blush pinks, muted peach tones, soft dusky blues and deep dark green. The ideal foliage to use alongside your flowers at Christmas time is blue spruce, mistletoe, eucalyptus, holly and ivy. I’d love to hear what your festive colour palette is for this year! Do you do the whole shebang and even link items like your wrapping paper, Christmas cards and napkins with your theme? Get in contact here with your festive ideas and please ask if you have any Christmas flower questions.